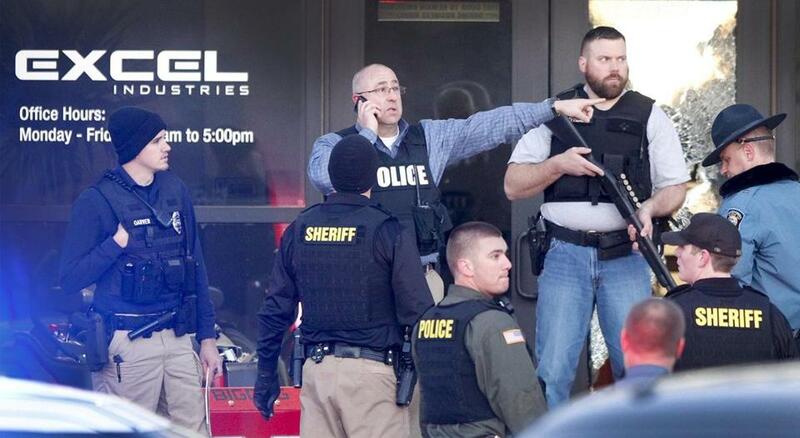 Police guarded the front door of Excel Industries in Hesston, Kan., on Thursday after a shooting rampage. The news of a mass shooting in Kansas unfolded during the GOP presidential debate on Thursday night – an irony we’ll get to in a moment. A gunman armed with an assault-style weapon drove around Hesston, Kan., shooting people and then storming the factory where he worked. He killed three and wounded 14 before being shot dead by a law-enforcement officer. It’s unfortunate that this senseless massacre, like so many others, is unlikely to change the minds of any of the GOP candidates onstage at the CNN debate. The dominant Republican position on the Second Amendment has hardened into zealotry. As the Washington Post put it after the San Bernardino shooting last December, candidates have moved from gun rights to gun pride. “You don’t stop bad guys by taking away our guns. You stop bad guys by using our guns,” Ted Cruz told a crowd at a shooting range late last year. The requisite photo op showed him checking out a hefty-looking handgun. So it’s even more jarring when a progressive Democrat seeking the highest office in the land hews to some of the same positions on guns as the GOP. At least, that’s how Bernie Sanders voted in 1996 on the crucial issue of research into the roots of gun violence and the effect of gun ownership on public health. But before getting to Sanders’s damaging vote, some background is in order on the sorry history of congressional funding for gun research – and the ill-considered politicization of social science that could have helped efforts to staunch the epidemic of mass shootings in this country. Written by former US Representative Jay Dickey, an Arkansas Republican, the so-called Dickey Amendment has had a decided chilling effect on research on gun violence for decades. Dickey, now safely removed from the toxic environs of a divided Congress, has come to his senses and repudiated his own measure. “Research could have been continued on gun violence without infringing on the rights of gun owners,” he wrote in a recent letter. “Somehow or some way we should slowly but methodically fund such research until a solution is reached. Doing nothing is no longer an acceptable solution.” Although President Obama issued an executive order to allow the CDC to resume research, Congress has consistently refused to authorize funding. All of this brings us to Sanders, and his voting record as a Vermont congressman in the 1990s. In an effort to repeal the Dickey Amendment and restore funding to the CDC, Nita Lowey, a Democratic congresswoman from New York, and Republican congressman Mike Castle of Delaware introduced an amendment to provide $2.6 million to the CDC for “issues related to firearms use.” Although a majority of House Democrats supported the proposal when it was introduced in July 1996, Sanders apparently had other ideas. The Independent congressman voted with Republicans to defeat the amendment, 263-158. Over the course of his presidential campaign, as more shootings have taken place, he has changed his position. Sanders issued a statement after the San Bernardino murders last December that called for more CDC funding, according to Reuters. But the damage has long been done. And while Sanders’s vote on Lowey-Castle was taken 20 years ago, it serves to call attention to his mixed record on gun control over the years. A more current example: He recently received two Pinocchios from the Washington Post for his explanation of his controversial 2005 vote to give federal immunity to gun manufacturers. Hillary Clinton has, by contrast, addressed these issues head on, calling for more research to “learn a lot more about the characteristics of people who should not have guns.” As she put it in a town hall meeting last fall: “No issue should be beyond study in America. That’s a denial of everything we believe in our country.” She’s right. That’s one of the many reasons that this page endorsed her for president in the New Hampshire primary, and that’s why she deserves the support of Democrats in Tuesday’s Massachusetts primary. Robust support for the restoration of federal funding for gun violence research should be front and center as a Democratic campaign issue. On principle, as Nita Lowey says, it seems cowardly to prohibit research because you fear what you may find.